I was recently listening to April Volkey’s podcast, “Anchored”, where she interviewed Jeff Liskay. During the podcast Jeff & April briefly discussed swinging egg flies. Both agreed that it was an effective method for catching steelhead but didn’t delve into the topic at great length — but should have. In a world where nymph and pinning rigs focus on a dead drift presentation, how is it that swinging natural looking flies in an unnatural manner can be so effective? If you fish winged wet-flies, down and across, to rising trout (which I do) this “phenomenon” of fish taking natural looking flies presented in an unnatural fashion isn’t phenomenal at all — fish do it all the time. In fact, for those anglers that do it well, it will likely out perform both dry fly and nymph presentations under the same circumstances. The fly fishing lexicon is wrought with catchall terms and “drag” is one of them. In the purest sense, drag occurs when the leader and/or line moves faster than the fly. When line and leader move faster than the fly, tension is increased and it impacts the position of the fly. 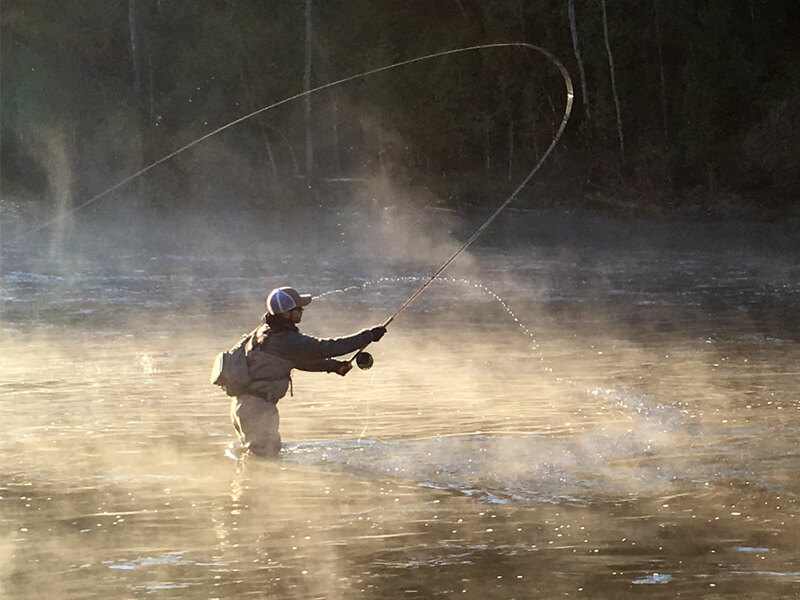 Whether you swing a fly, cast a dry or nymph on a tight line, the goal of the exercise is to present the fly in a desired position in the water column or on the surface. To adjust for variances in vertical and horizontal water velocities (that apply unwanted tension to fly line or leader) the angler manipulates the line by mending. For the dry fly angler, visible drag (a wake appearing on the fly) is a visual indicator they have failed in their desired presentation. The waking fly is also a visual anomaly to trout and unlikely to elicit a strike. While the anglers’ brain, being larger and more powerful, anthropomorphizes our presentation failures onto the trout and we assume fish desire food moving at the same speed of the current over all other speeds. Once a fly sinks below the surface, visible drag disappears. The fly no longer creates visible wake lines as a dry fly would when it’s moving at a different speed than the current and the visible indication that “something is different” no longer exists. When a down and across angler presents an appropriate sized Greenwell’s Glory (a blue-winged olive wet fly imitation) on the swing, to trout feeding on blue-winged olive mayflies, the trout will readily eat the natural imitation even though it’s moving in an unnatural manner compared to the current speed and direction – with great, repeatable success. This is especially significant when we consider that blue-winged olives have a habit of riding in the surface film at a dead drift, for great distances before their wings dry and they take flight. For the down and across angler who has experienced the joy of fishing wet fly patterns underneath a blanket spinner fall, where trout are sipping bugs that are dead drifting on the surface, the “dead drift” mantra can erode even further. These rising trout will readily eat a sunken imitation that is swung past their nose when all natural offerings are passing by at a dead drift. To understand why trout and steelhead will eat natural imitations presented in an unnatural way, the angler must ignore assumptions about presentation methods and focus on the predatory behavior that triggers a trout to strike. If we draw an imaginary box in our head and place our strike triggers at the corners, our presentation (regardless of style) should simply try to satisfy those requirements to elicit a strike. We define the corners by size, shape/silhouette, motion and color. As studies have shown, a trout’s aggressiveness and dominance is determined by genetic factors. When your fly passes through the strike zone of an aggressive fish, the angler’s job is easier as fewer corners of the box need checked to trigger a strike. Satisfy the size and shape requirements (or shape and color) and it’s fish on. Steelhead that have the genetic disposition to leave western rivers and feed in salt, do so because they have a deep, ancestral need to feed heavily for future reproduction. While stream competition and forage levels can play a role in how or when a rainbow trout decides to head to salt, it’s a safe assumption that most who do (and survive) are aggressive, alpha predators. Does this mean Steelhead are somehow big, dumb fish that will eat anything? Of course not. If a large streamer doesn’t check the corners of the box because steelhead have eggs on the brain, you could throw a streamer all day without success. As for the ones that do eat streamers, it means the recurring debate of whether streamer color really matters is valid. As to the question of whether a bait/fly needs to move at the same speed of the current when fished below the surface to catch fish, the simple answer is no. Being in the strike zone for longer periods of time is more important. For the nymph angler, presenting a drag free drift is less about the speed of the fly’s movement and all about keeping the fly down in the strike zone. For the nymph angler that prefers more weight than less, the fly is often moving slower than the surrounding current. Vertical drag and vertical belly in the leader are much more important than speed of the fly. If the fly isn’t in the zone, it might as well be in another zip code. The advantage of a down and across presentation of an egg fly or nymph below a sink tip is precision and control. With the right combination of tip, leader and fly, the angler can swing a natural imitation into the strike zone and keep it in the cone of vision/strike zone for a much longer period of time. The duration of the presentation should not be understated or under estimated. The longer a fly remains in the strike zone (on an ultra slow swing) the longer your fly has to check the corners of the box for the fish and trigger a strike. While I personally don’t swing egg flies to steelhead, as a down and across angler of trout I understand why it works and works so well. Thankfully, outside of steelhead circles, down-and-across angling remains limited to a small, occult-like following compared to the numbers of nymph and dry fly anglers. Like most who swing for steelhead, I prefer the seasonal opportunity to throw big beautiful streamers and search for that mind-blowing tug but I’m going to suggest you swing an egg at least a few times – because even a dyed-in-the-wool streamer addict should understand why and how it works. If belly in the swing is the enemy for streamers it is beyond the kiss of death when you swing a small natural imitation like and egg or a nymph. Learning to control your swing with a small fly and longer leader will make your streamer game epic.